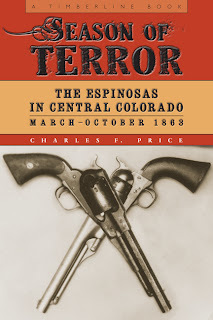 The first comprehensive, book-length treatment of the story of three Hispanic outlaws - two brothers and a nephew - who, in the Civil War-era Colorado, set out with the motive of killing every Anglo in the Territory and actually did end the lives of an estimated thirty-two victims before their rampage came to a bloody end. Improbably it is a story whose impact spread quickly from a remote regional incident to one that eventually reached as high as the desks of Secretary of War Edwin M. Stanton and President Abraham Lincoln. It involves a cast of compelling characters including frontier legend Kit Carson; General James H. Carleton, the imperious military commander of the Department of New Mexico; John M. Chivington, the so-called "Fighting Parson," Methodist minister and unscrupulous military commander of Colorado Territory who later perpetrated the infamous Sand Creek Massacre of Cheyenne Indians; the Espinosas themselves, poor farmers who were fervent members of a lay religious sect called The Penitentes, intent on avenging outrages committed against their families by American soldiers; an old Army scout named Tom Tobin, largely forgotten by history, who tracked down and killed two of the outlaws; and numerous other larger-than-life figures who together played out an episode in frontier violence and cultural confrontation that has been for too long unjustly neglected or, when noticed at all, fantastically sensationalized. "In the entire history of the American West there were no more fascinating characters than the 'Bloody Espinosas' of Colorado Territory. This fast-paced, amazingly objective, intriguing, and highly recommended study of the Espinosas, as well as those who hunted them, will keep you turning the pages." Jerry Thompson, Ph.D., Regents Professor of History, Texas A&M International University, author of Contina: Defending the Mexican Name in Texas, and Texas and New Mexico on the Eve of the Civil War: The Mansfield and Johnson Inspections, 1859-1861. Cavalry of the American Revolution, Westholme Publishing, May 2012. Edited by Dr. Jim Piecuch, Professor of History at Kennesaw State University in Georgia. From the bitterly contested no-man’s-land between American and British lines in New York and New Jersey to the scorching pine forests of the South, the cavalry of both armies fought valiantly throughout the American Revolution. This volume explores several aspects of the cavalry’s role in the war, which has often been overlooked in general histories. Charles F. Price contributed to this effort with "Cavalry Operations at Eutaw Springs". Originally presented at a conference at Wofford College, South Carolina, Price's article resulted from research done, in collaboration with Lee F. McGee of Pittsburgh, PA, a fellow cavalry enthusiast, for the novels Nor the Battle to the Strong (2008) and The Sunshine of Better Fortune (forthcoming). The work explains the sources consulted in order to write a convincing account of the cavalry operations in the Revolutionary War in the South. “Espinosa Scapegoating Goes Awry: The Strange Case of Capt. E. Wayne Eaton,” April-May 2009. “Doc Holliday in Salida: Sightseeing or Deadly Business?” February-March, 2010. “Bat Masterson: Buena Vista Marshal?” September-October 2010.